When graduation nears, it is rarely an easy time for the graduate. The future holds promise, but is so tenuous that it is hard for any 18 year old to grasp. Such is the case of Glory O’Brien, an intelligent young girl, who is filled with hope and uncertainty. As graduation nears, she suffers a permanent breakup of a long friendship and begins to experience visions of a future life. Written with force and a persistent drive, author Amy S. King adds an important book to young adult literature. “Glory O’Brien’s history of the future: a novel” is a good read for those graduates who may think they are alone in looking for the path to travel. They are not. The questions that may haunt them are the same questions that propel this story. Try it on for size. Rose has a beloved dog named Rain. When the dog goes missing during a storm, Rose has to change her daily routine in order to search for her pet. Written by Ann M. Martin, the story deals with a protaganist who has Asperger’s syndrome. We all have our comfort levels that need to be stretched from time to time. Often we find this a challenge and uncomfortable. If you are curious, learn what happens to Rose when she must “let go” in order to find her dearest companion--- her dog. Life seems so complicated at times. What if you could read but 7 words that would direct, console and challenge you the rest of your days? T.A. Barron, author of the New York Times bestselling Merlin Saga, has created such a work. 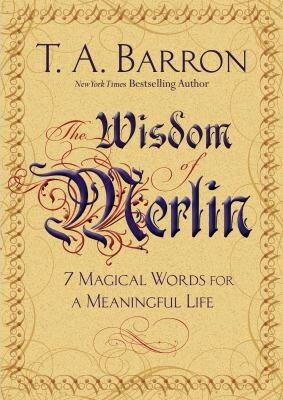 “The Wisdom of Merlin: 7 magical words for a meaningful life” is a fictional guide full of wonder and simplicity. It’s 76 pages of inspiration that encourages one to live life to the fullest. You won’t wish to put it down; it’s Merlin at his finest hour.